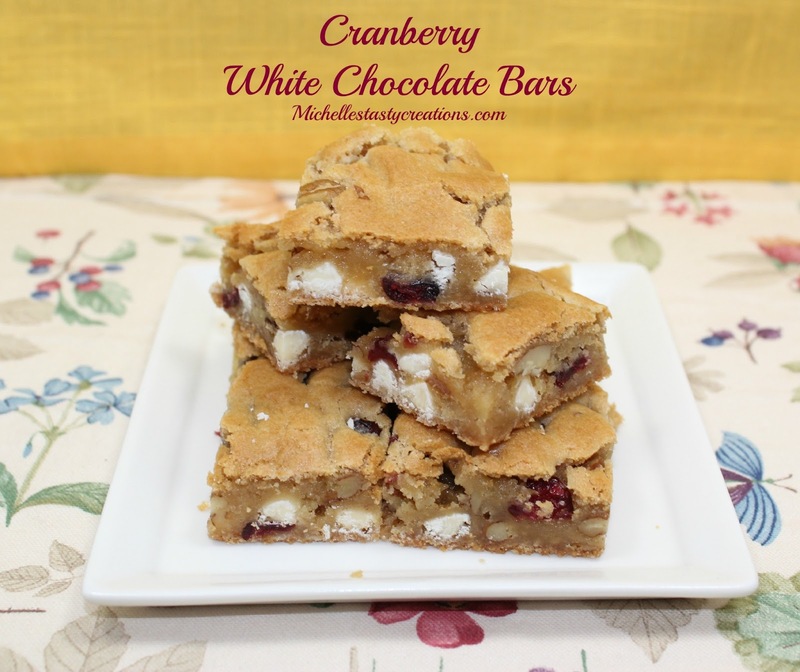 Here is the most requested recipe (and best seller) from the good ole' days of Michelle's Mixes :) Cranberry White Chocolate Bars. I love bar cookies because they are fun to make, have just as much flavor as cookies, and don't require me to stand in the kitchen changing out baking sheets every 8 - 10 minutes. These bars are chewy, tender, and full of flavor. Give them a try and let me know what you think! Preheat oven to 350 degrees. Line a 9 x 9 or 7 x 11 baking dish with parchment and spray with cooking spray and set aside. In a small bowl mix the egg, melted butter or margarine, and vanilla. Set aside. In a medium bowl mix the baking mix, and the rest of the ingredients well. Add the egg mixture and mix until combined. The dough will be thick. Press the dough into a 9 x 9 or 7 x 11 prepared baking dish. Bake for 25 - 30 minutes. Do not over bake. You want the middle to be soft and chewy. Cool in pan then run a knife around the edge to release the sides and lift out of the dish. Cut into squares and serve.